The BHS Battery Washing Cabinet (BWC-2) cleans harmful contaminants from the surfaces of forklift batteries with the push of a button. This important process extends forklift battery lives and reduces electrical problems in forklifts. Best of all, staff can continue doing other tasks while the BWC-2 cleans battery cases since the machine is fully automatic. Forklift batteries accumulate electrolyte on their surfaces throughout their time in the warehouse. The charging process can leave acidic vapor on the batteries and boil-overs leave behind residue. Battery cases may have small leaks, which can also cause build-up over time. With the push of a button, the BWC-2 washes away all of these surface contaminants. The powerful BWC-2 uses 240/480 V 3 ph power. 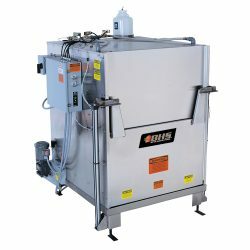 This heavy-duty machine works well for battery washing service providers or operations that want to quickly wash their batteries on-site. The BWC-2 has adjustable wash times for efficient cleaning and stainless steel construction for extra durability. The cabinet can accommodate a range of battery sizes and is quick and easy to operate. Separate air and water delivery manifolds improve the cabinet’s efficiency. Battery Wash Cabinets from BHS help extend the life and improve the performance of your lift truck batteries by keeping them free of harmful contaminants. Contact our sales team at 1.800.BHS.9500 to learn more about the BWC-2 or other Battery Washing Equipment.